Liz Did It: I Made An Art! Last night my friend Amber hosted a sleepover for some of the girls. Is it still considered a slumber party when you’re all pushing 30? Anyway, she has a cute painting hanging in her living room that we all loved and we started talking about how easy it would be to make some of the paintings we see in stores. It reminded me of something I made a couple years ago which caused me to yell like a four year old “I MADE AN ART!" For less than $10 I cobbled together a simple painting from items bought at AC Moore. 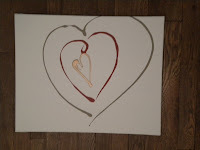 I bought a plain canvas and a few of those acrylic stencil paints that you can get on sale for less than $1. 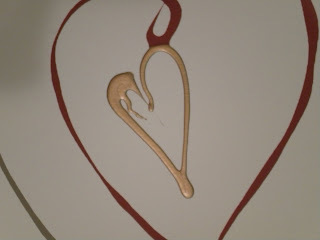 I painted the canvas cream and let it dry, then stood above it and made concentric hearts with each color paint, squeezed straigh from the bottle. Complicated right? Admittedly I am no Picasso but it was super simple and cheap to create something that matched my décor and the technique (if you call it that) can be used in many variations. It’s now hanging in my kitchen, which has become the land of misfit art.